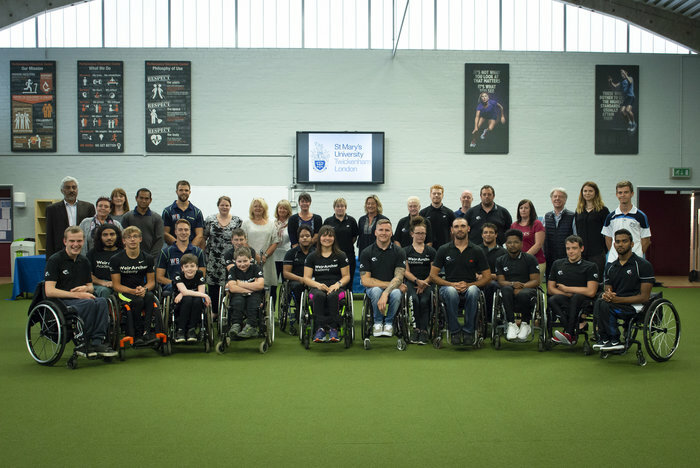 St Mary’s University, Twickenham is delighted to announce a partnership with six-time Paralympic champion David Weir MBE and his coach Jenny Archer’s CBE Weir Archer Academy. The partnership will allow the athletes in the Academy to use St Mary’s world class sport science and strength & conditioning facilities on a regular basis as part of their training programme. The agreement also means the University can provide its students with the opportunity of giving sport science support and coaching to Paralympic athletes. 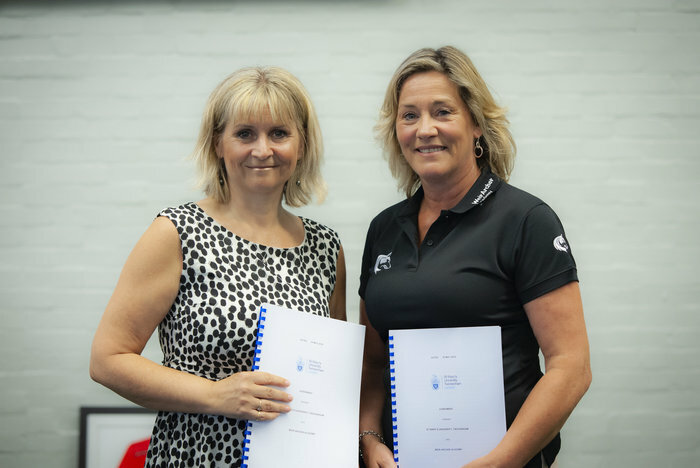 Contracts for the partnership were signed at an official launch on Wednesday evening which saw almost 30 athletes and coaches from the academy join David and Jenny to celebrate the occasion. 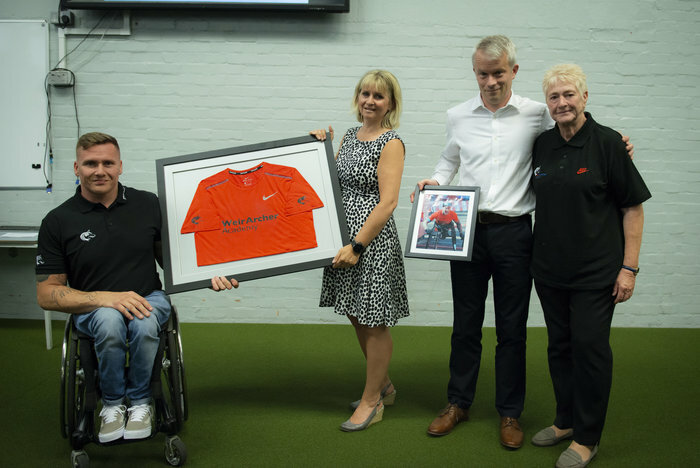 During the event David presented St Mary’s with a framed shirt which he wore for all his media appearances leading up to his eighth London Marathon win in 2018 and a signed picture of himself winning the race. The Weir Archer Academy provides athlete and coaching support and expertise across all levels and abilities including working with schools in the South East of England. It works with clubs and coaches in the region to provide access to the Academy for international development for under-resourced counties and help improve health, self-development, confidence, social inclusion and, for some, the ultimate sporting success on a global stage. Senior Lecturer in Sport Science at St Mary’s Richard Burden, said, “St Mary’s is delighted our students will have the opportunity to work with these world class and developing para athletes. 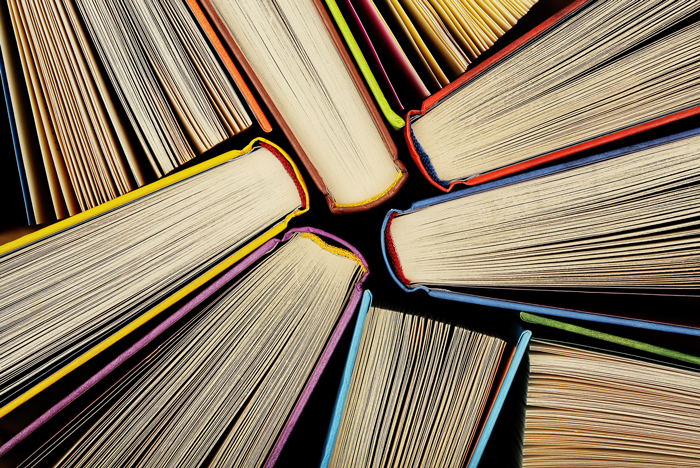 It will provide the opportunities to translate what they learn in the classroom and apply it in real life in the field. That is where sport science adds value to athletes and coaches. As the next generation of para athletes develop towards the podium, we are also developing world class athlete support personnel alongside them. Both St Mary’s and Weir Archer are agreed that this is an exciting venture and gives a unique advantage to both."